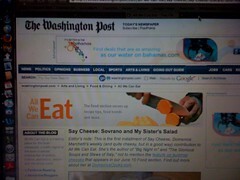 Say Cheese: Welcoming the Washington Post to Cheese Tuesday! Wednesday may be Food Day, but caseophiles know that the real action occurs the day before, on “Cheese Tuesday.” On the web, Jamie Forrest’s Serious Cheese and the Kitchn’s Cheesemonger share their weekly finds, advice and expertise every Tuesday, and of course you can often catch a cheese tasting report right here when yours truly is posting on schedule. The San Francisco Chronicle‘s Janet Fletcher writes the only weekly cheese column in print, to my knowledge, though it moved to Sundays when the Chronicle consolidated their food section. We’re thrilled to welcome my hometown newspaper, the Washington Post, and their new “All We Can Eat” food section blog to the weekly cheese love-fest. Local cookbook author Domenica Marchetti has joined the blog staff with a new weekly cheese column, “Say Cheese.” It launched today with a taste of Sovrano, an Italian cheese by the makers of Grana Padano. And pick up a copy of the Post on Wednesday (or read online) for Domenica’s cheesemonger’s dozen picks for your summer cheeseboard. 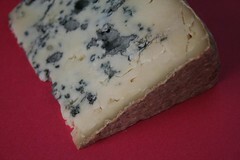 We’re looking forward to seeing more coverage of the local artisanal cheese scene in the Post!